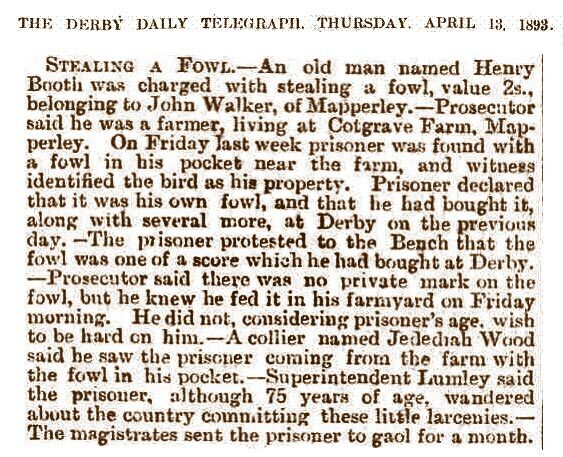 Stealing a Fowl — An old man named Henry Booth was charged with stealing a fowl, value 2s, belonging to John Walker, of Mapperley.—Prosecutor said he was a farmer, living at Cotgrave Farm, Mapperley. On Friday last week prisoner was found with a fowl in his pocket near the farm, and witness identified the bird as his property. Prisoner declared that it was his own fowl, and that he had bought it, along with several more, at Derby on the previous day. -The prisoner protested to the Bench that the fowl was one of a score which he had bought at Derby. 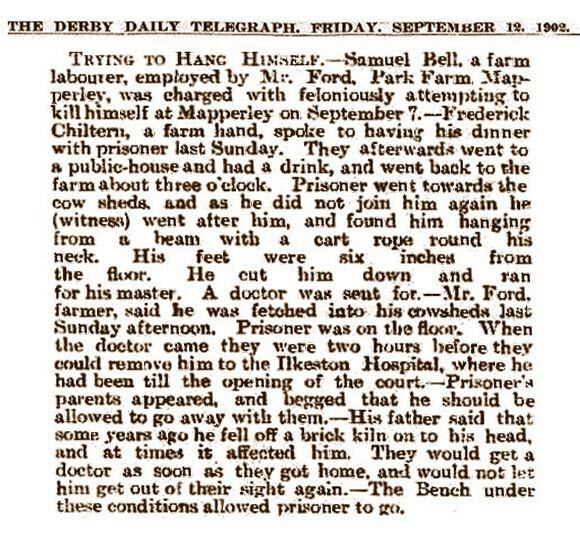 — Prosecutor said there was no private mark on the fowl, but he knew he fed it in his farmyard on Friday morning He did not, considering prisoner's age, wish to be hard on him.— A collier named Jedediah Wood said he saw the prisoner coming from the farm with the fowl in his pocket.—Superintendent Lumley said the prisoner, although 75 years of age, wandered about the country committing these little larcenies.— The magistrates sent the prisoner to gaol for a month. 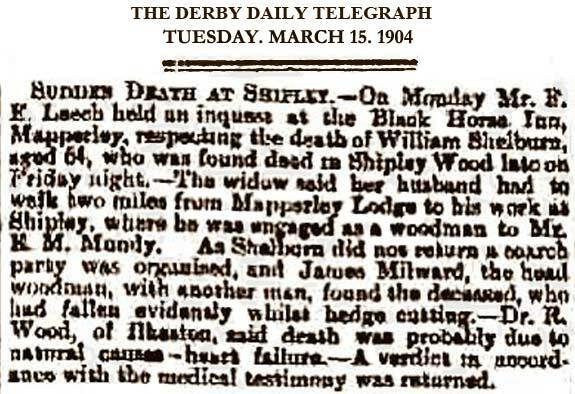 SUDDEN DEATH AT SHIPLEY – On Monday Mr. E E. Leech held an inquest at the Black Horse Inn, Mapperley, respecting the death of William Shelburn, aged 64, who was found dead in Shipley Wood Lane on Friday night. 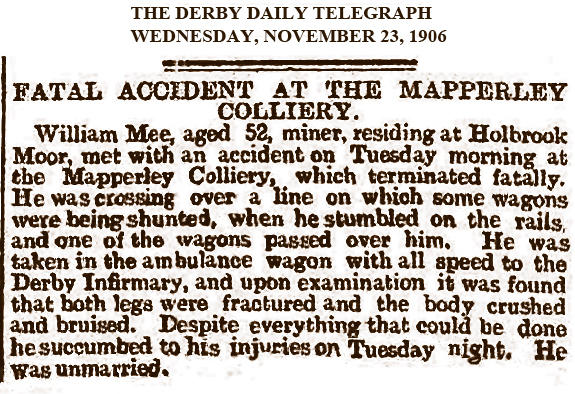 – The widow said her husband had to walk two miles from Mapperley Lodge to his work in Shipley, where he was engaged as a woodman to Mr K. M. Mundy. 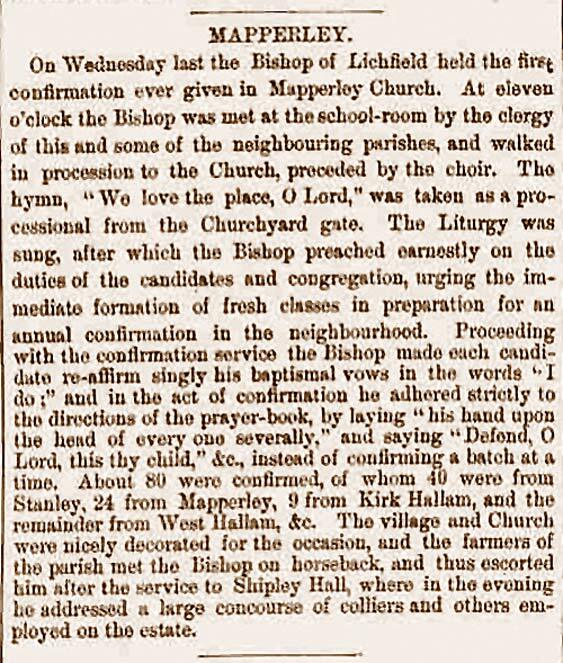 As Shelburn did not return a search party was organised, and James Milward, the head woodman, with another man, found the deceased, who had fallen evidently whilst hedge cutting. – Dr. R. Wood, of Ilkeston, said death was probably due to natural causes – heart failure – A verdict in accordance with the medical testimony was returned.